Welcome to the FOSDEM 2018 Blog! As many of you surely already know, this year we're at FOSDEM and you can find our stall in building AW. While much of this blog - as you probably expect - will feature PINE64's existing and upcoming products as well as peripherals, I will make sure to do the meetup justice by highlighting the things from the countless other projects that catch my eye. And boy am I sure there will be plenty of such things. Sadly, its unlikely that I will be able to cover any of the talks or lightning talks as for much of the time I will be either at the our stall or walking around checking things out. In any case, I invite you to have a read. Enjoy! We're happy to announce that we got two powerful boards coming in Q1 2018; the Pine H64 and the RockPro64. 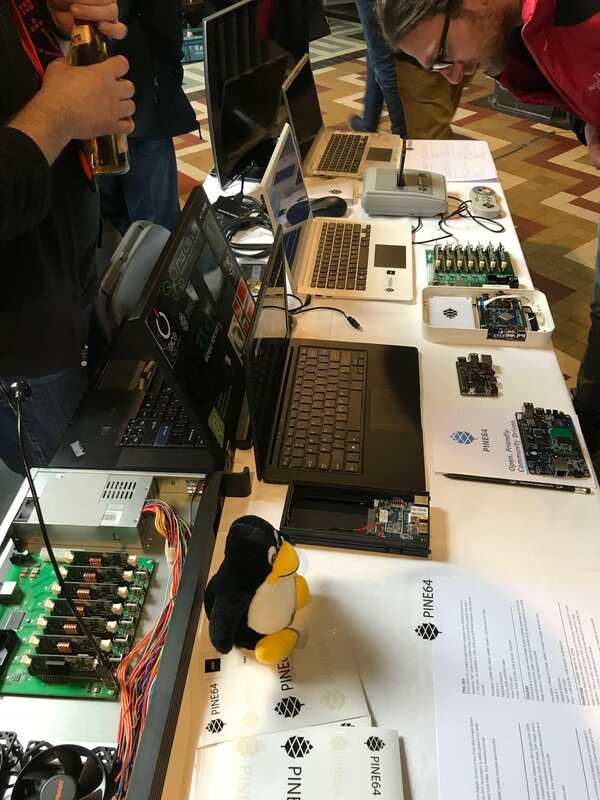 Both boards are featured at our FOSDEM stall this year, so if you are attending make sure to drop by and check them out! The prior is a successor, or an upgrade if you like, to the Pine A64 while the latter is a powerhouse featuring a top-of-the-line Rockchip SOC for power-hungry applications. Both boards have the same dimensions as the original Pine A64 (133mm x 80mm x 19mm). Both support some of the existing add-ons, dongles, accessories and POTs (more info re. compatibility will follow at a later date). Both will support Android and Linux Distributions. Both feature multiple fast IO and expansion options as well as eMMC storage. The RockPro64 is the more powerful out of the two boards debuting in Q1 2018. It is based on the RK3399 hexa-core SOC consisting of a dual-core ARM Cortex-A72 and a quad-core ARM Cortex-A53. The GPU on the SOC is a quad-core Mali-T860MP4 with support for OpenGL ES1.1/2.0/3.0 and OpenCL1.2. Its one powerful board, so to keep the thermals at bay there are mounting holes for a heatsink and a header for a fan on the PCB. For those interested in the full feature set of the SOC you can read the feature specs here. The RockPro64 offers a wide range of IO and expansion options (listed further down). The highlights of this board (in my opinion) are the USB-C - which can also be used to drive a second display (for a total of two) that can output 4K - as well as a PCIe4 connector for whatever expansion card you can imagine (e.g. a USB 3.1 PCIe 4 expansion card). In the future a PICe to NVMe adaptor will be available in our store for those who require ultra fast storage for their use-case scenarios. That said, the existing two fast USB interfaces (3.0 and C) open up a lot of possibilities in their own right when it comes to fast storage (and not only). The inclusion of SPI Flash will also make it possible to boot straight from one of the mentioned storage solutions. All that said, perhaps its the price that's the real highlight of this unit, as it starts at approx. $60 for the 2GB RAM variant (see all prices listed further down this post). The board also allows you to drive a LCD display right from the PCB (compatible with the existing LCD panel) and two cameras (the existing 5Mpixel camera module is compatible), that can be useful in embedded and robotics applications. To be precise, there are two LCD options on the board; MiPi which supports the existing LCD panel and an eDP port. So you can choose which one to use dependently on what you've already got in production or at hand. Its worth pointing out that we will also offer a version with the RK3399Pro SOC called Rockpro64-AI, which includes a Neural Network Processing Unit (NPU) for AI applications; "the computing performance of typical deep neural network Inception V3, ResNet34 and VGG16 models on RK3399Pro is better and improved nearly hundred times" (source). Its a piece of high performance AI hardware compatible with 8bit and 16bit AI software frameworks allowing for easy development of turnkey solutions. More information about this variant of the board will be made available closer to launch date (listed further down). I'm not going to write about software at this time - suffice to say that it will run the usual suspects - but the good news is that all the hard work ayufan and other devs have done in the past few months on the Rock64 will, by and large, carry over to the RockPro64. [edit 31/01/2018] The Pine H64 is now available for purchase. 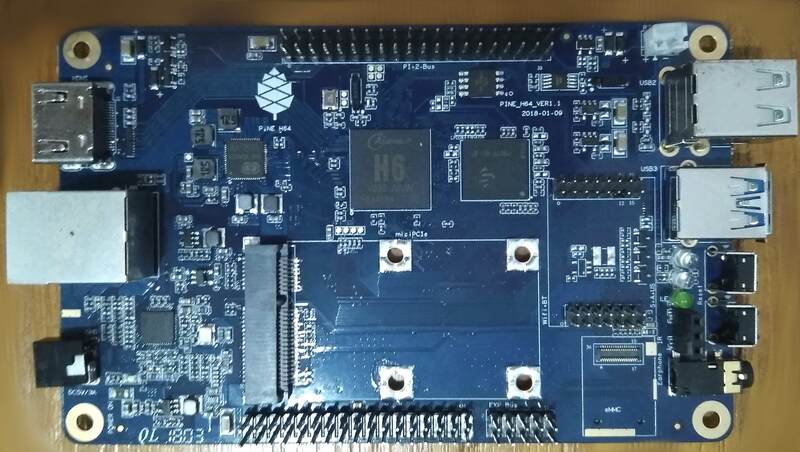 The Pine H64 is based on the new Allwinner H6 SOC and is a successor to the Pine A64. 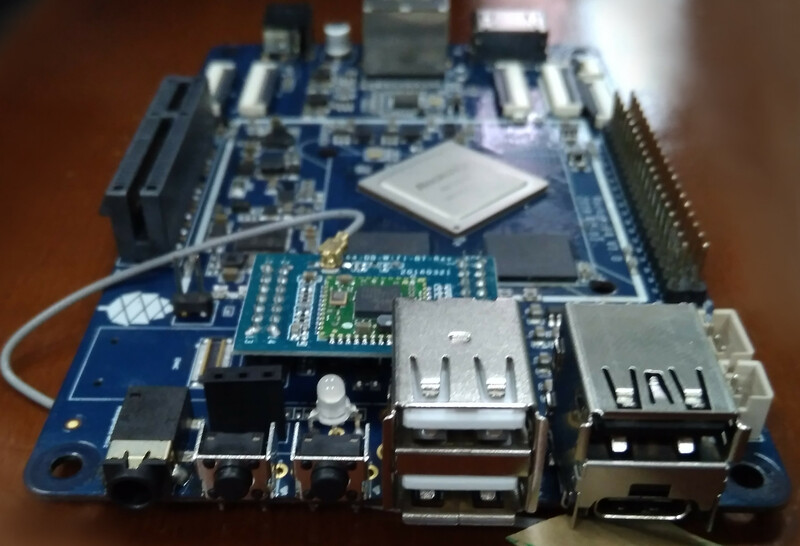 It is a quad-core ARM Cortex-A53 SOC with a Mali-T720 MP2 dual-core GPU capable of 4K60 playback and HDR -- which makes it a compelling media board. It will be available in 3 different variants: 1GB, 2GB, and 3GB LPDDR4 RAM. So for those of you who always wanted a bit more RAM on your Pine A64/LTS you are bound to be happy now that such an option is available on this new unit. It will also feature 128Mb of SPI flash, that will allow it to boot off of a USB 3.0/2.0 HDD or SSD in addition to bootable micro SD cards and eMMC modules. You can find the complete feature set of the SOC here. Similarly to the RockPro64, the the Pine H64 PCB is packed with a wide range of IO and expansion options. The one that probably stands out the most to is the mini PCIe connector. The mPCIe connector opens up a number of different options for storage, WiFi cards or other expansion cards - e.g. a USB 3.1 expansion board - just to name a few obvious examples. With the Pine H64 you could conceivably support multiple fast storage mediums, turning it into a NAS or server. I'm sure people will think of other interesting applications for all this IO. Speaking of the available IO - if you already have the Pine A64 DAC POT or the BT/WiFi module, you will be happy to hear that both are compatible with this board. 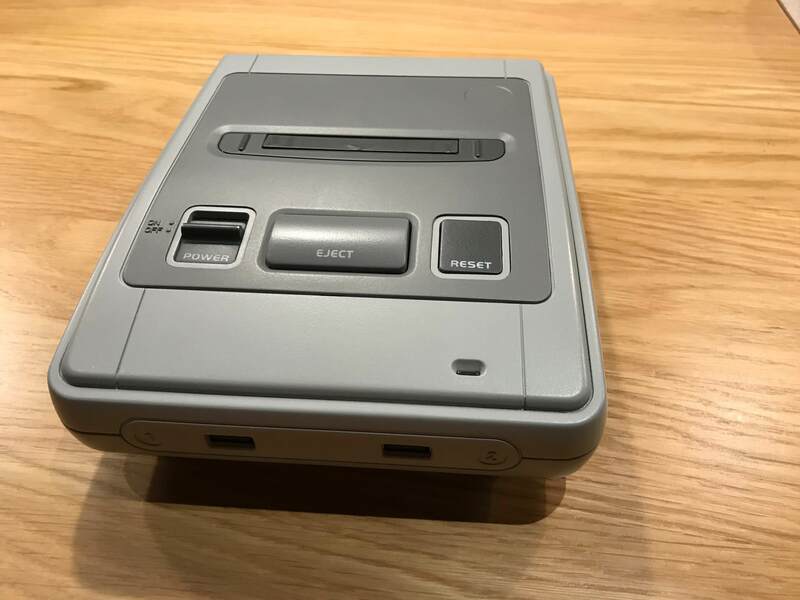 Similarly, as is the case with the RockPro64, the footprint is identical to the Pine A64/LTS, so if you have a purpose built enclosure or an off-the-shelf case its highly likely that the Pine H64 will fit it just fine. Another piece of good news is that at the end of January Allwinner will release a BSP with kernel 4.9 for the board. This means that while we all wait for mainline we will have a relatively new kernel to work on. 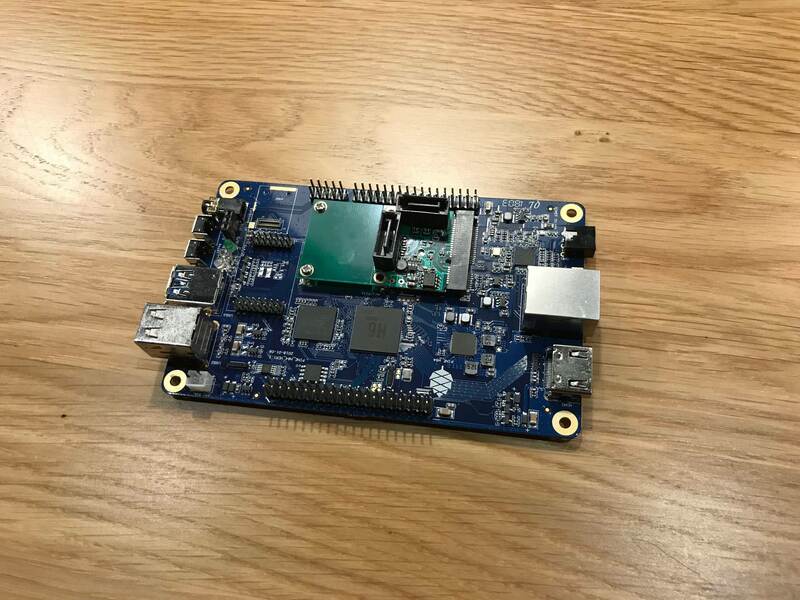 As with the RockPro64, I am not going to write anything about software at this point other than you can obviously expect to run Android and Linux on the board. Summing it up, I feel that its safe to say that the Pine H64 is a worthwhile update to the Pine A64. Personally I see the inclusion of the much faster Mali-T720 MP2 and USB 3.0 as well as mPCIe as major selling points for this board; making it both viable as a media board (especially if ayufan makes one of those awesome ATV images for it) as well as a low powered NAS or a server that can drive multiple fast storage solutions. You can probably think of other awesome applications for this board as I'm sure there are plenty both for play and embedded applications. 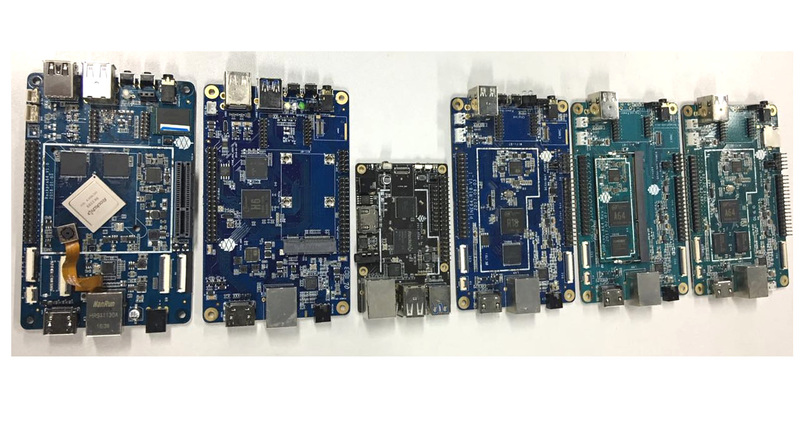 Concluding the first part of this blog, I leave you with a picture of the PINE64 SBC lineup for the foreseeable future. 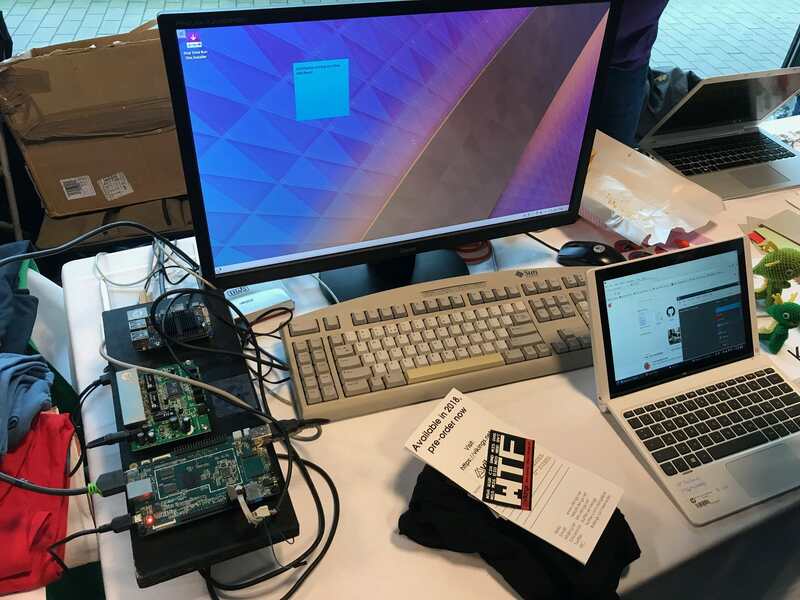 Check back in a 5 days to read about some of the other exciting things we'll be showing at FOSDEM this year... as well as the countless other things from other Open Source and Open Hardware projects that I'll make sure to cover. It has been a great first day at FOSDEM. By 1.00 PM we already gave out all our fliers and had to stick down the last two copies (as well as put up product descriptions on Pinebook screens). At times there were more people at our stall than we could possibly talk to - sorry if we missed you! All in all, I think its fair to say that there huge interest in what we had to show on day 1. This is in part thanks to the contents of our table and partly due to the awesome turnout at FOSDEM this year - the place is literally packed. As a side-note - as is always the case at his event getting something to eat is a real pain; the picture below shows a fraction of the coffee queue. Yes, those people are waiting to grab a coffee. But I digress, as you'd expect on our table you could check out the Rock64, Pine H64, the RockPro64 as well as the Clusterboard. 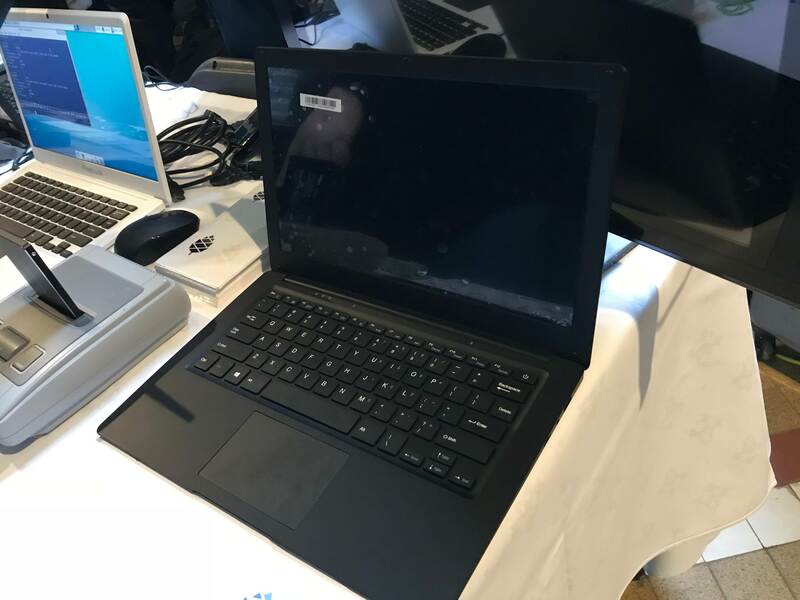 But TL also brought along a Black 13,3” Pinebook with a 1080p IPS display and a a clear-case Pinebook. The clear-case Pinebook really got a lot of attention. I’d say it really stole the show. If we we’re selling this unit at FOSDEM I swear we’d have easily sold more that 100 units. One of the users I’ve spoken to said he’d set up a petition online that we make the clear-case a reality; I wouldn’t be surprised if he wasn’t joking. 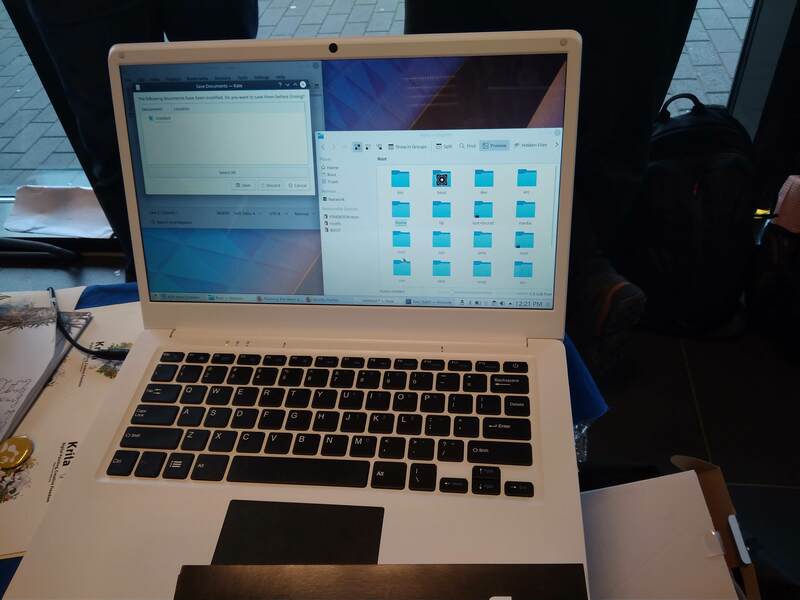 There is no denying that its one cool looking Pinebook (see picture below). TL said he’d consider a one-of production run of the clear case Pinebook; I’m sure you’ll hear about that when - or if - it happens. As for the Pinebook with a 1080p IPS, I must say that the screen is really quite amazing and so is the quality of the case. The screen is bright, vivid and the viewing angles are really quite awesome … as you’d expect from and IPS screen. I also feel that the build quality (especially flex of the plastic on the palm-rest edges) is much better on this prototype than on the current production units. 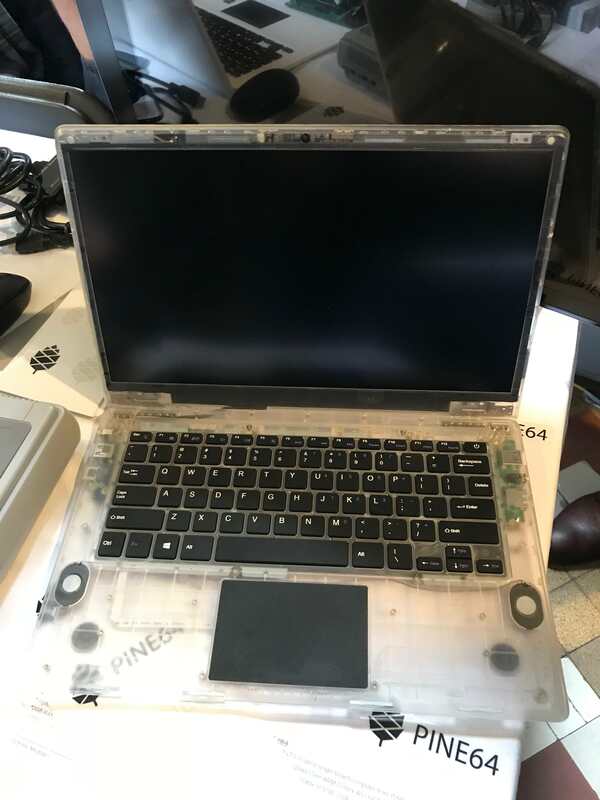 No word if this prototype will turn into a retail unit anytime very soon but I think that its likely that future iterations of the Pinebook will have this shell and screen. Its almost a given. Onto the boards (I won’t repeat the specs etc., here - read the announcement post if you haven’t already); In the pictures below you can see the RockPro64 in the existing Playbox case with the LCD and a camera module attached (its fully functional - just disconnected in the pictures). You may already have these peripherals if you're a Pine A64/LTS or SOPine user. In the picture you’ll also see a NVMe PCIe SSD card inserted (I’ll try to get a better picture tomorrow) in to the PCIe slot on the RockPro64. Granted the drivers work (they should I am told by reliable sources) then this sort of super high spec storage should be available for this board on day 1. I know Xalius will also be testing 10GbE solutions … can’t wait to hear how that pans out. We also showed the Pine H64 which just laucehnched at the end of January with a dual SATA mini PCIe card installed. No word on if this exact board will find its way into the shop at this point - but there will certainly be a dual SATA mPCIe card available at some point for purchase in the store. So if you’re interested in a dual HDD NAS solution delivering solid performance, then it looks like the H6 may end up being a really good option - especially at this price. As you’d expect the recently released cluster board also to a lot of attention at the stall. Xalius brought his pre-production unit in a server-rack case, but we also have a fully slotted production unit that people can handle. A lot of people were asking about potential applications and use-case scenarios. To learn more about the clusterboard I suggest you read this thread - I probably can’t make the subject justice. There are probably two other things that stand out in the pictures which most of you haven’t seen before; the little rectangle box and the retro-gaming case. 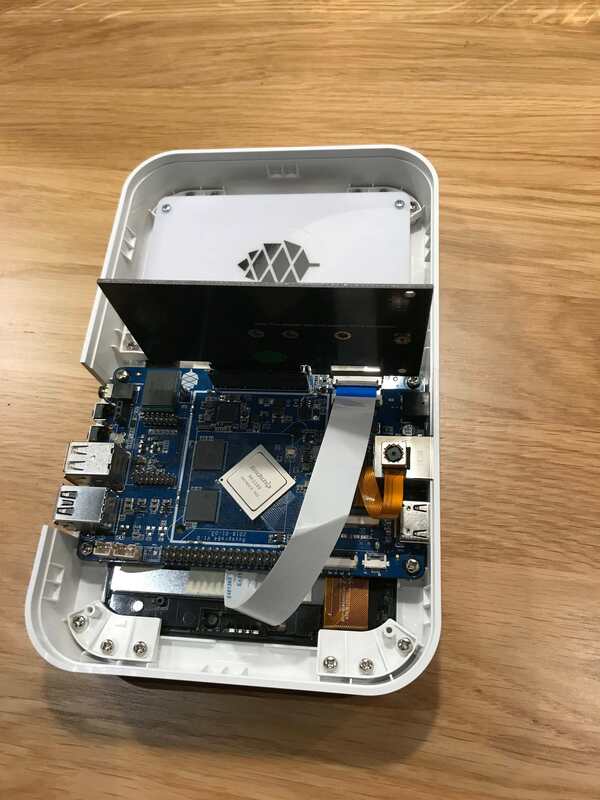 Lets start with the prior; its the Transformer which is produced by PINE64’s sister company CloudMedia. To put it bluntly, spec-wise its a Rock64 (with either 2Gb or 4GB RAM / 16GB or 32GB eMMC) in a nice case. Instead of the USB 3.0 port you'd find on the back of a Rock64, you get a USB 3.0 -to -SATA connector inside the case which features the JMS578 chip. One things that the pictures can’t quite convey is how high quality of a case this is - it really feels premium. You can run all available Rock64 OS images on this unit as the hardware is 100% compatible with Rock64. Please click this link to learn more. Now onto the Retro-Gaming case, which is modelled after a certain 90’s console some of you may recognise. This is a fully functional case - what I mean by writing this is that all the mechanical aspects of the case work, including the eject, reset and power buttons as well as the LED all perform their job. Its more than a case actually, there are additional PCBs inside that actually expand its functionality. For instance, you’ll be able to place a 2.5” HDD into the cartridge slot. 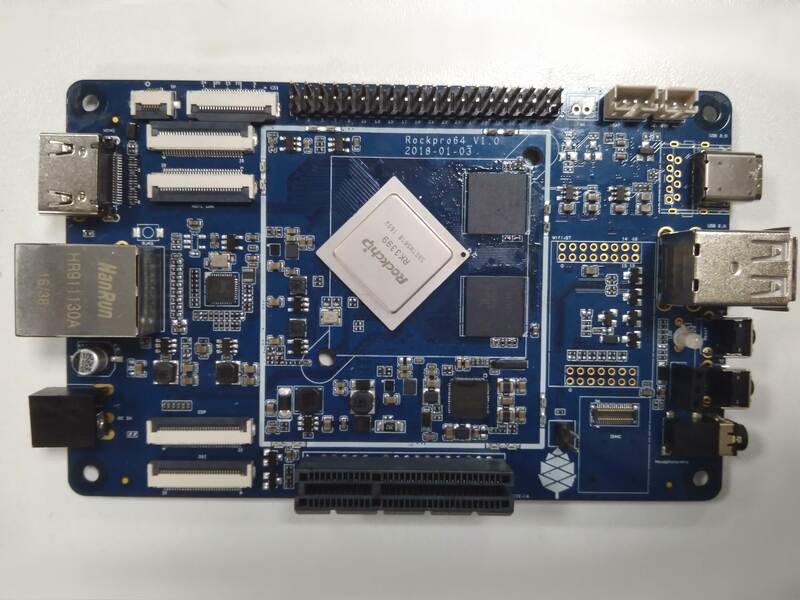 It will be available (much) later this year and is compatible with existing and upcoming PINE64 boards (as well as popular boards from other brands). Its no secret that the RockPro64 is going to be an amazing piece of kit for retro-gaming (as well as Android gaming, for those who are into it) - and so I feel that this case will make a neat companion for this board. I’ll add that this is likely not the last gaming-related peripheral from PINE64 … stay tuned for more info in the coming months. Lastly, I just came back from an evening with people from SUNXI, LibreELEC, KDE and other projects. Great company all around and fantastic Ribs + beer dinner at Amadeo Brussels. I truly do hope this becomes an annual tradition. Tomorrow I will (hopefully) get to walk the floor a bit more - I know that there are other PINE64 devices at FOSDEM which I am just aching to see. Then there are the dozens of other amazing projects which I really want to write a sentence or two about if time permits. Anyways, check in tomorrow for more from us at FOSDEM 2018. 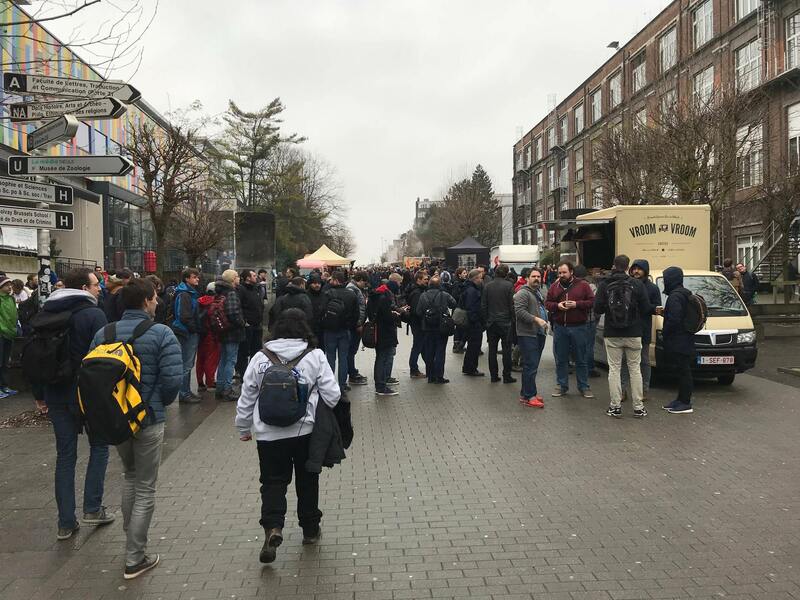 FOSDEM has come to an end and so has this short blog. Day 2 of FOSDEM at the stall was as busy - if not busier - than the first. More questions about the practical applications of the clusterboard, more questions about the upcoming boards and many more questions about the availability of the clear-case Pinebook (for those who haven’t read carefully the previous entry, its not available for purchase) were asked and answered. In result none of us got to see much at FOSDEM this year other than our immediate surroundings and some projects of particular interest to PINE64 users. More on this later. We did, however, got a chance to meet a lot of new people and some whom we’ve chatted with for months (or years), but never spoken to face-to-face. Its always good to put a face on an internet handle. Thank you all for stopping by to have a chat —- it was really great to meet you all. We also had the pleasure of establishing contact with new projects and being fed ideas for the future by developers; we will let you know if and when some of come to fruition. 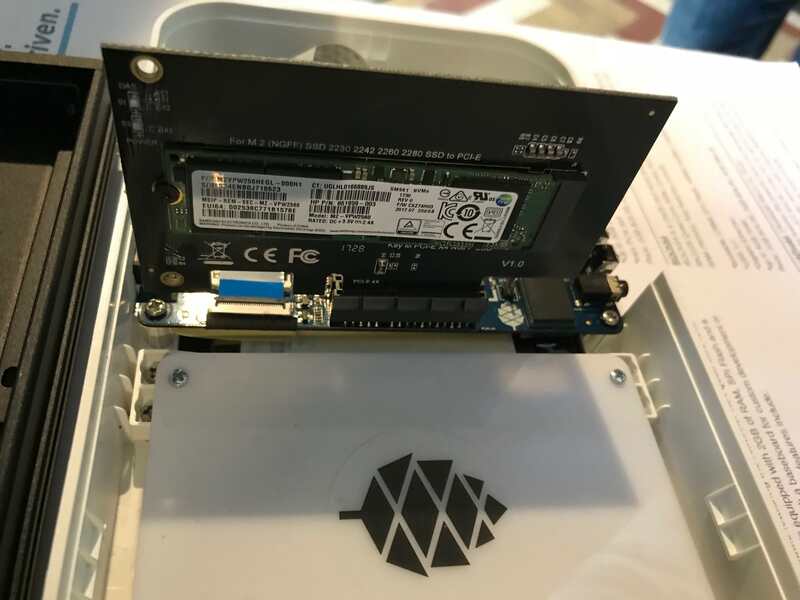 Now onto more PINE64 stuff; for starters, I’m including another 2 pictures of the RockPro64 (I realise the previous photo was pretty terrible and pretty pointless); the first shows a PCIe expansion board with two SATA connectors and the second a PCIe NVMe SSD attached to the board. Ayufan got to take the prototype home with him - cannot wait to hear if either or both of these expansion boards will work without a hassle. Personally, I’d be more interested in attaching more than 2 HDD’s (remember that the RockPro64 also has USB 3.0 and USB C) to this SBC, but I have been told that there are viable applications for running high-speed storage on this board. Anyways, how cool is that ? 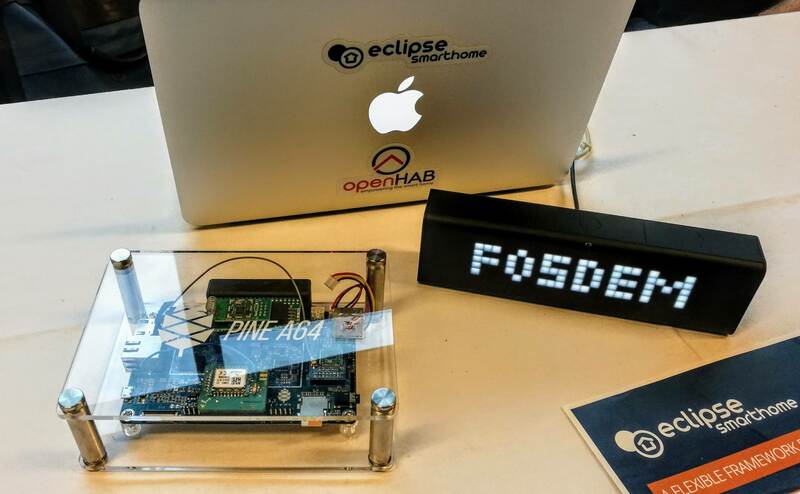 But thats not all, there was more PINE64 at FOSDEM; a Pine A64+ running OpenHAB with z-wave module was shown in conjunction with the LaMetric smart clock at the Eclipse stand. Very cool I must say. This is a part of a much larger and still growing trend of open source IoT. There was a lot of talk about this subject at our stand too. One of the people I spoke to offered a number of suggestions as to whom we should reach out to for support in current and upcoming boards - I have duly noted the suggestions and spoken to TL about it. I have also promised to include other projects that catch my eye in this blog and so here are the two that I found particularly awesome and which got my attention. 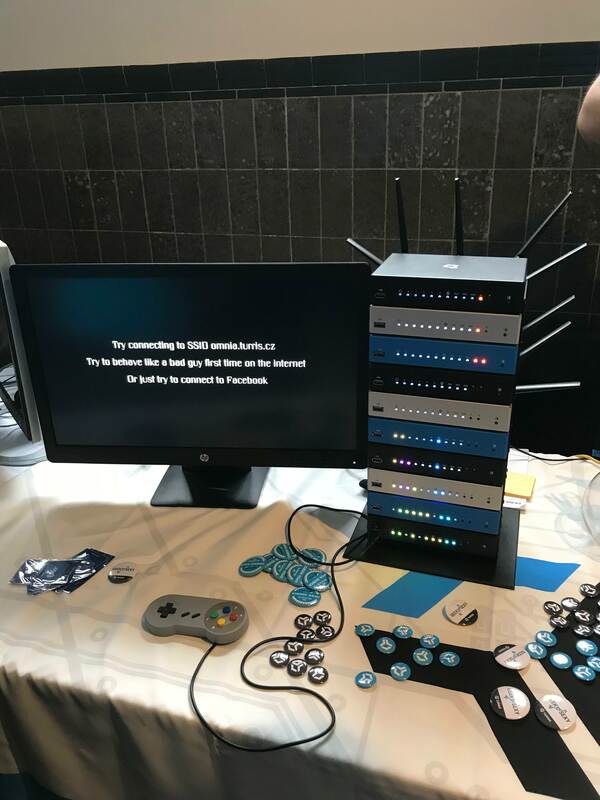 Our immediate neighbours - Turris Omnia - were showing off their open source router that can also function as a NAS, printserver, and much more. Its a great device and they certainly came up with a fun idea to attract attention to their stand; they stacked a number of Omnias on-top one another, so that the indicator LEDs on the front effectively acted as a display that one could play Tetris on. Not only did it look awesome but it was fun to play too. The winner could walk away with an Omnia of their own. The second amazing project shown was from Ham Radio and Libre Space Foundation. 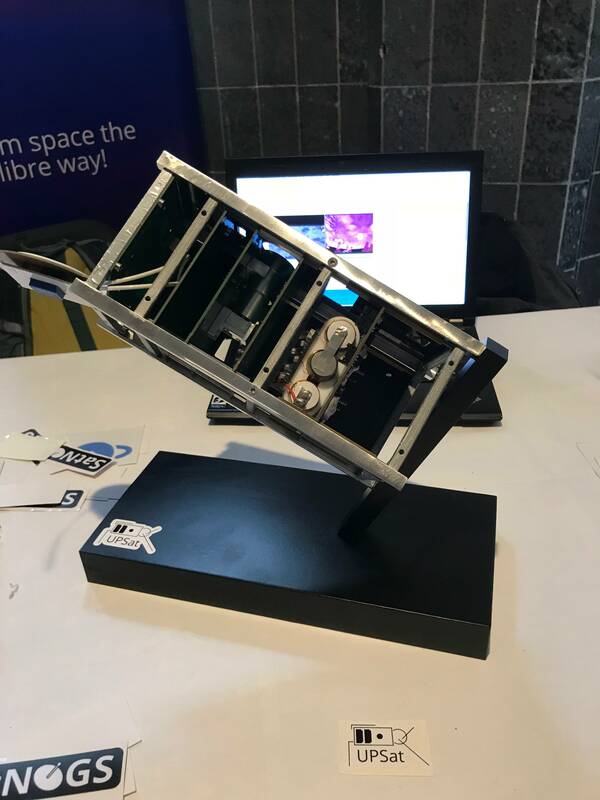 They were showing SATNOGS, an open source project of network satellite ground stations, and UPSAT - the first open source hardware and software satellite. Sadly I cannot not write much more on this subject simply because I know nothing about it - but I strongly suggest you check out their site to learn more about this awesome project. You should check out the FOSDEM website and youtube as all talks and videos from the floor should be available online now. This is all for this year’s FOSDEM blog. All in all it was a great but tiering experience, and it exceeded our expectations in every way. 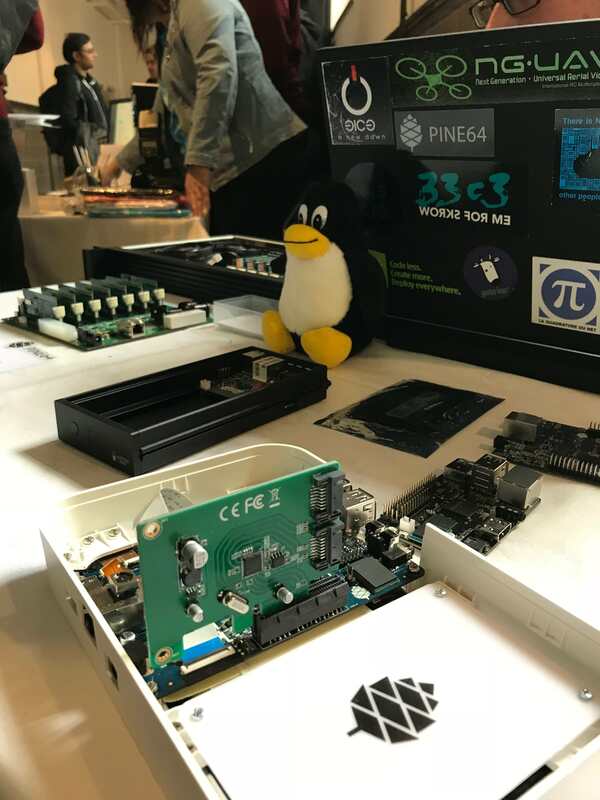 Its was really great to meet so many existing PINE64 users and to talk to those who are interested in our existing and upcoming products. It has also proven to be a valuable experience in terms of feedback - we have taken all suggestions onboard and will consider them in the coming weeks and months. Hope to see more of you next year!